When I was in Washington, D.C. a few months ago the Dome of the Capitol building was under renovation. There was a lot of scaffolding so I only took a few pictures. However when I saw this scene in the Reflecting Pool I thought it was much more interesting! Here is how it looked from the water. For more on this theme look here. 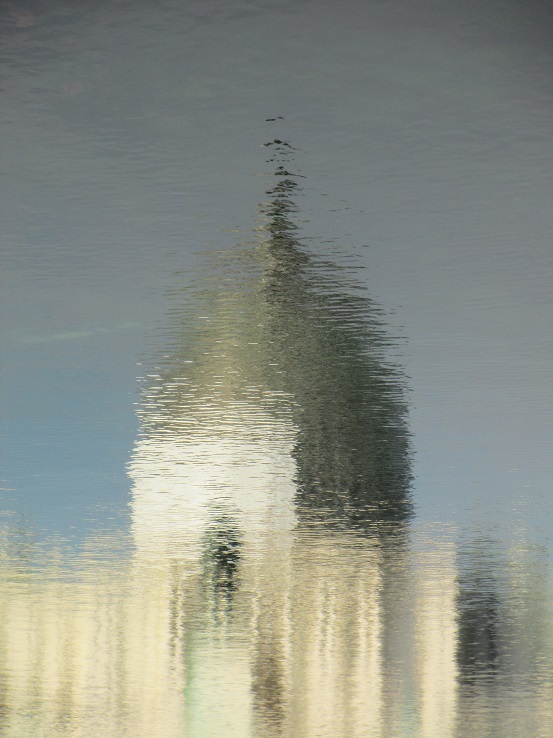 This entry was posted in Travel, USA, Washington D.C. and tagged intricate, reflection, water. Bookmark the permalink. I thought of that too – the movement of the water made it more artistic! That’s different – and very pretty. I didn’t expect to see a reflection like that – I’m glad that I noticed it! Great capture, Meg. :) Very interesting and beautiful! Oh that is wonderful………..looks like an impressionist painting. I just love it!!! Thank you! I had been so busy looking at the buildings that I almost didn’t notice the reflection in the pool. It is one of my favorite memories of that day! It should be. Oh this would be a great postcard. Just love it! I like the idea of a postcard…that would be so much fun! I love this! Reflections are one of the things I love to photograph. Thank you – I’m so happy to have found it! I see Your photo as art – beautiful. Well spied and captured. Thanks for becoming a subscriber. Happy blogging. Thanks and I’m looking forward to following your blog! Thank you so much Lola – it was such a unique reflection! I love this – it looks like something from a dream. It’s a great reminder to keep looking everywhere and to look at the world in all different ways. It’s one of my favorite photos of a reflection! With good reason. Looks like a painting. It really did look more like a painting than a photo! Thank you – seeing it was a wonderful surprise! Lovely and delicate, looks like a painting or pastel illustration. It was a wonderful thing to see and the water made the reflection very wavy! Great shot. I think this my be my all-time favorite shot of the dome! Thank you so much Patti – I felt very fortunate to have been there at the right time!